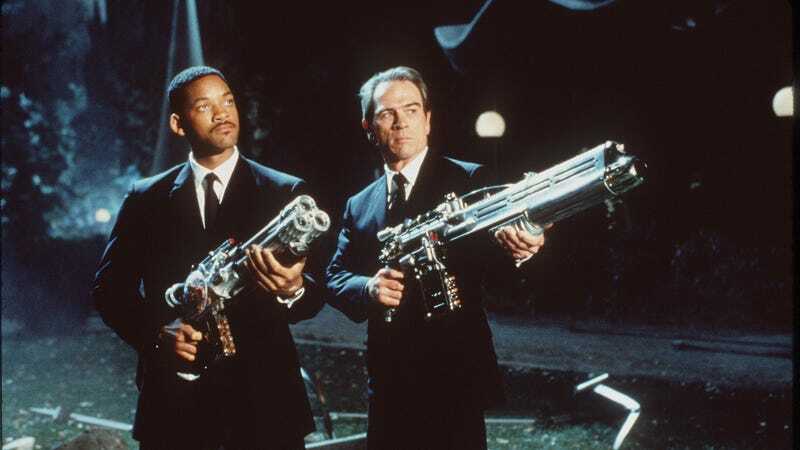 Answering an age-old question—i.e., “How do you make a new Men In Black movie when Tommy Lee Jones and Will Smith really don’t seem to want to?”—Sony has set a release date for a J and K-free spin-off to the long-running sci-fi comedy franchise. The untitled MIB spin-off, based off a script from Iron Man and Transformers: The Last Knight screenwriters Matt Holloway and Art Marcum, is set to arrive in theaters on May 17, 2019. The last time we heard about plans for a new film set in the Barry Sonnenfeld-created universe, it was as a bizarrely premised crossover with the 21 Jump Street movies. That appears to have been put down once and for all, though, and now Sony seems to just be hoping that lingering Men In Black nostalgia—informed by the semi-recent success of Men In Black 3—will get fans of alien espionage back in theaters for a new set of Neuralyzer-happy agents, even without the series’ marquee stars there to lure them in with a catchy rap theme song.